The orbit of near-Earth asteroid 2014 HQ124, first discovered on April 23, 2014, is shown in this NASA graphic. 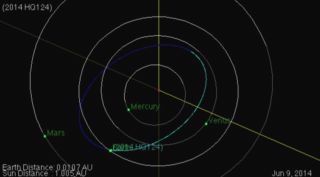 The asteroid will fly by Earth Sunday, June 8, at a safe distance of three times the Earth-moon distance. A newfound huge asteroid, nicknamed "The Beast," is expected zoom by Earth this weekend, and you can get a sneak preview of the space rock flyby today (June 5). The asteroid 2014 HQ124, which is the size of a football stadium, poses no chance of hitting Earth in its flyby on Sunday (June 8), and will pass by at a range of three times the distance between the Earth-moon on Sunday (June 8). It was discovered on April 23 by NASA's Wide-Field Infrared Survey Explorer, a sky-mapping space telescope. This afternoon, the online Slooh community observatory will host a live webcast preview of asteroid 2014 HQ124, beginning at 2:30 p.m. EDT (11:30 a.m. PDT/1830 GMT) at its website: http://www.slooh.com. You can also watch the asteroid 2014 HQ124 webcast on Space.com, courtesy of Slooh. The webcast will feature a discussion with Slooh astronomer Bob Berman, host Geoff Fox and asteroid impact expert Mark Boslough. A sky map from Slooh shows the path of Near Earth-Asteroid 2014 HQ124, or "The Beast." Asteroid 2014 HQ124 will be traveling up to 31,000 mph (14 km/s) — 17 times faster than a shot from a high-speed rifle — when it makes its closest approach to Earth on Sunday at 1:56 a.m. EDT (0556 GMT) at three lunar distances away, a Slooh representative said in a statement. One lunar distance, or the distance between the Earth and the moon, is about 238,855 miles (384,400 kilometers). Berman said it is "disconcerting" that an asteroid this large flying so close to the planet was only spotted less than two months before its nearest approach to Earth. "HQ124 is at least 10 times bigger, and possibly 20 times, than the asteroid that injured a thousand people last year in Chelyabinsk, Siberia," Berman said in a statement. "If it were [to] impact us, the energy released would be measured not in kilotons like the atomic bombs that ended World War II, but in H-bomb type megatons." NASA estimates that more than 90 percent of the mountain-sized near-Earth asteroids, or objects wider than 0.6 miles (1 km), have been discovered. A space rock of this size could unleash global destruction if it were to collide with Earth. Smaller asteroids have been much more elusive. There are believed to be 15,000 near-Earth asteroids 460 feet (140 m) wide, and of these, only about 30 percent of those have been found. Meanwhile, NASA scientists estimate that there are more than 1 million near-Earth objects with a diameter of about 100 feet (30 m); less than 1 percent of those have been detected.